Liturgy 3.2: The use of church buildings in relation to the mission of God expressed through the Church, discussion based on readings from Richard Giles, Re-pitching the tent, Norwich: Canterbury Press, 3rd ed, 2004). Last weekend, we looked at the origins of liturgy, looked briefly at the meaning of ‘signs’, ‘icons’ and ‘indexes’, and looked for liturgical or ritual expressions in various secular spheres, including theatre, cinema, sport and civic life and in domestic life too. This week, I want us to look particularly at space and its role in the liturgy: liturgical space as liturgical icon and liturgical sign. But first of all, I want us to be aware of two problems as we think of some of these issues. 1, Since the European Reformations, there has been a commitment to the language of the people and moves towards a commitment to ordinariness in language. If we reduce worship to language, there is a danger of reductionism when it comes to signs and understanding, for example, when it comes to symbols, icons and manual action. Many people regret the every-day style of language introduced in the Alternative Prayer Book in 1984. It lacked the language of poetry and drama associated with the 1662 Book of Common Prayer, the King James Version of the Bible, the English of Shakespeare’s sonnets and plays. This problem is addressed in The Book of Common Prayer (2004), which has tried to restore poetry, drama and beauty to the language of the liturgy, recognising that vernacular idioms of speech pose problems. How do we bridge the gap between us and God? How do we move from the chatter in the pews to the language of awesomeness, language that makes me feel I am in the presence of God? Since the Reformation, we have been dependent on the primacy of language. By this, I mean there has been a singular dependence on the medium of verbally constructed language. 2, Secondly, since the Reformations there has been a commitment to the primacy of the individual, of the believer, and of individual faith. This has been coupled with a triumph of informality over convention – in dress, clothing, manners, formality, music, &c – so that popular entertainment becomes more important than high culture. This is reflected then in the use of space. How do we make a multifunctional hall a sign of the kingdom, of heaven? And if we do not want to, how do we use appropriate language for people who are gathered to approach the heavenly throne in awe and in reverence? Does Gospel music mean hymns whose only difference from modern music is words? Is there a danger of creating a God who is immediately accessible and losing the ‘otherness’ and ‘awesome-ness’ of God. If God is not different, then why do we worship God? These are questions that I hope we can ask and seek answers by considering a theology of space, and its implications for church buildings, and the use of church buildings in relation to the mission of God expressed through the Church. Close your eyes; create an image of a church that was important at a key stage in your life: perhaps when you were a child, or when you reached a particular stage in faith; or one from your holidays, or where you were married. What is the first thing you see there? A monument to a local landed family? A rood screen that separates the chancel from the people? What we see first is not an accident of church architecture. It faces us immediately because it reflects not just the priority of the architect, but those who told the architect what they wanted. 1, The altar: Many collegiate style churches have the seating along each side wall (north and south), so that the altar at the east end is the first to catch your eye. This is so the chapel in Trinity College Dublin, in many college chapels in Cambridge and Oxford, and in some churches in Ireland too, such as the Church of Ireland parish churches in Collon, Co Louth (Diocese of Armagh), based on the plans for King’s College Chapel, Cambridge, and Glenealy, Co Wicklow (Diocese of Glendalough), based on the Chapel of Saint John’s College Chapel, Cambridge, and one of Pugin’s great Gothic Revival chapels, the chapel in Saint Peter’s College, Wexford. 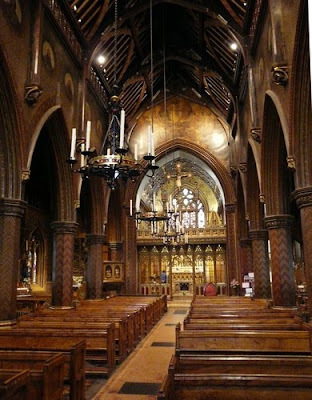 Consider how many altars or tables are placed in a separate chancel area; from the outside, you can see it is a separate part of the building; inside it may have steps up to, be railed off, be surrounded by sacred images, have attention drawn to it by candles, a dramatic window or painting above it, special seating around it, or a chancel arch that marks the transition from the place of the laity to the place of the clergy. What does this say about the roles of the clergy and the roles of the people? What is being said, on the other hand, if the altar is in the centre of the building? This may force an arrangement so that everyone is looking in rather than out, that gives the impression of introspection rather than a people being equipped for mission. The pulpit is usually to the side nowadays. But in the past, this may have been the first object you would have seen in a church, especially in the day when the triple-decker pulpit was common in churches in the Church of Ireland and the Church of England. The pulpit may still be the dominant feature in many Presbyterian and Methodist churches. Do you feel comfortable about going into the pulpit? Or do you feel self-conscious, that you are towering over people or even looking down on them? Does it say the Word is more important than the Sacrament? What do they expect from someone who preaches from the pulpit? What is being said when you preach from the chancel steps or from the nave? 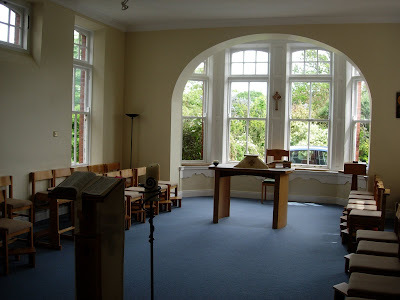 If you ever experienced the previous layout of the chapel here, you may remember the way we emphasised the balance between word and sacrament, between pulpit and altar, between proclamation and celebration. What are we saying with the present arrangement? Is anyone from a parish where the church has a separate baptistery? In some churches, the font is near the door, and so if you are a child entering a church, and your eyes are at a level much lower than an adult’s, then this may be the first thing you see. Does the place of the font link it with the concept of welcome? What about the distance between font and table? Does this convey something about the pilgrimage of faith, the journey of the Christian life, from being incorporated into the Body of Christ to being invited to the Heavenly Banquet? In some Baptist and Brethren churches, and also in CORE in inner-city Dublin, instead of a font there is a pool or large water tank, often hidden under the floorboards. When you go into a Gothic or mediaeval cathedral, the rood screen separating the choir from the nave may be first thing you notice. What function do you think it serves? What is it saying about sacred space and secular space? A possible exercise is to compare with the function and role of Communion rails, and the function of the iconostasis in Orthodox churches. A vaulted roof may look like the hull of a boat or an ark; we are like the disciples in the boat, who find new direction, new meaning, when, in the darkness of their fear, they realise that Christ is with them as their captain, that Christ is in control. 6, The rector’s prayer desk? Does your rector move from the prayer desk to the altar/table when it comes to celebrating Parish Communion? I remember this as being a normal movement during what was known as “mangled matins” followed by short Holy Communion. But what are we saying when we do this? Is the ministry of word more or less sacred than the ministry of sacrament? 7, A monument to an old family? Is the place of respect we give to old families taking away from the attention to the living today? Is it a reason for people not wanting to worship in neighbouring churches? Is it harkening back to the kingdoms of the past instead of looking forward to the Kingdom of God? I first carried out this exercise with my sons when they were small children. As a small boy walking into that church, the first thing he could see was people already seated in the pews with their backs turned to him. Is this the sort of welcome your parish church offers to first-time visitors or to children? I was taken aback. I even thought for one moment he was joking. But he recalled being taken by the hand into a small village church on a Greek island. And he explained that as he entered a church that seemed to be in darkness, in contrast to the bright sunshine outside, his eyes were immediately drawn up to the light in the dome surrounding the image of Christ Pantokrator found in the dome of so many Greek churches. How many of us can see that the first thing a stranger sees when they come into our church is Jesus? Can they say that about your church? Or is the first thing they see a monument to a dead general or member of the landed aristocracy? Or the screen for the power point presentation of hymns? How space allows or facilitates, directs or restricts, movement during liturgy; how furniture is placed in relation to liturgical action and in relation to other pieces of liturgical furniture; how we use these freely or feel restricted; all these are key considerations. Consider how there has been a crisis of liturgical space in the adaptation of some Roman Catholic cathedrals and churches built in the Gothic Revival style. When the tabernacle was moved to a side chapel, the eyes focussed on the bishop’s throne, and many people felt they were entering a church that had been emptied, left vacant, left without a focus for worship. But this also raises questions about the chair for the minister who presides at the liturgy. How do we reflect our theological priorities in the use of space in our churches? They convey, communicate different visual theologies. For example, a long church building, such as a cathedral, with long naves, rows and rows of seats, and everyone facing the same way can symbolise that we are all heading in the same direction. With a focus that is before and ahead of us, this layout can give us a sense of the glory and transcendence of God. They also make processions and movement to the front straightforward. Can you think of some problems created by this layout? If you want to proclaim the Gospel from among the people, and arrange a Gospel procession to the centre of the church, can the reader be heard? If there is no microphone, having a Gospel procession undermines the Gospel reading rather than enhancing it. Sharing the peace can be clumsy and difficult with this arrangement. The font at the back corner, near the south porch or the west door is in danger of being out of sight and out of mind. And if it is being used during the main Sunday service, can people turn with ease to see and affirm and own what is happening? On the other hand, a worship space arranged in a circle, in an ellipse, or in the way we have the chapel at present, makes it easy for the worship leaders, readers and preachers to engage with everyone who is present. Sharing the peace becomes easier, and it is easier to create a feeling of being gathered together around one table for sharing on Communion. Some people feel that there has been a loss of reverence, a loss of the sense of awe and mystery. Is it more difficult to adopt appropriate body postures for prayer? Can a bride walk down the aisle, or a coffin be carried in and out at a funeral? Where do you place the font? There is an inner circle, but how do create a sense of looking out into the world? So, what the eye sees may be as important as what the hear ears, the tongue says, the heart feels. Space and symbol together contribute to the meaning of liturgy, convey theology, convey suppositions about belief and even express belief too. And this is important to grasp in order to see liturgy as not just about texts and reading texts. ● What kind of ceremonial is possible? ● What kind of ceremonial is appropriate? ● How may people take part? Church buildings can be meaningful for us, in both negative and positive sense of meaning. They are signs to us, and not always signs of the Church: they tell us whether the interiors reflected the social as well as the liturgical values of the people who built them, or the people they were built for. Are church buildings so rigid, such a strait-jacket, that they cannot serve our liturgical needs without distorting what we want to say and do, think and pray? What are the problems of having the font where we traditionally place it? How flexible can we be with traditional church layouts? Do pews make it difficult to move around and to shape the liturgy? Do we clutter our churches so much that it is difficult for people to realise the significance of space and place in our public worship? In other words, is the liturgy at the service of church architecture and furnishings or are church furnishings and architecture at the service of our liturgical needs? Consider the implications on some Sunday mornings of moving in front of the choir screen in Christ Church Cathedral, Dublin, to create a nave altar; the problems and opportunities involved in changing seating in a traditional cathedral setting; or the innovative altar that can be raised and lowered to be flush with the floor in Lichfield Cathedral. Churches may have a variety of uses, not all of which can be seen as liturgy. People come in to look at churches because they love looking at cathedrals and churches. Others come in for particular hobbies: they collect brass rubbings, they are tracing their family trees, they are interested in stained glass windows. You may have an unusual painting, tomb, monuments, charity plaques, organ … There is one church in Dublin that holds on to a curious 18th century fire engine, another with a bread shelf for distributing daily breads to the hungry poor in the inner city. One of the main ways people use our churches and the space in them, at some stage, is for musical recitals. These have their own rituals around them. What time do they take place at? Where they are staged – on the chancel steps? If you have choral recitals, are the choirs placed in the same place as the choir or music group on Sundays? If not, what is being said? The use of space, place and time signify the meaning that each event has on its own. It is obvious, is it not, from the notices that have gone out before, from the way the church has been lit, the way people have got tickets beforehand or been handed programmes as they came in. • or during the choral finale to Beethoven’s 9th to find a collection plate going round for the offertory as if this were the last hymn. • and out of the event. • and for those experiences to carry on having significance in the future for us. And we all have experience of this in everyday life, whether or not we are particularly involved in church life. In groups, sit and list essential elements of a church, and then try to sketch out that ideal church. ● the sources from which something fills my being with its possibilities. 2, the ‘fellowship’ could have been replicated in any social gathering. ● Of the other at which we might guess. ● There is a duration of time between coming to and moving back from. And it also has actual, physical movement and direction. Good planning of liturgy knows how best to use the physical and to rely properly on image. Good planning of liturgy knows the differing between reality and imagination. ● Entrance into the presence of God? ● Being in the presence of God? ● Departure from God’s presence? People come into the church, chatter, shake hands, take off their jackets, &c.
Then they come into the presence of God? How do we move from one stage to the next? ● you are one of the first individuals arriving? ● and you then find yourself as part of those who are being gathered as God’s people? How do we indicate that our direction is now focused not just on one another, but on God? ● That is the purpose of liturgical entrance too. ● The arrival of the last of the people ought to be the arrival of those who are going to gather those who have arrived into the worshipping community, the congregation, the Body of Christ. ● This can be signified in the movement from the back of the church to the front, which also signifies our preparedness to move even beyond that, into the gap between us and God that is bridged in our worship, in our liturgy. ● The dismissal – especially at the door. ● And we speak to God through prayer and praise, and in reception. So there are two directions in liturgy. ● Is Christ supposed to speak for us, from the people’s side? ● Or is Christ as mediator speaking God’s grace and favour to the people? ● Is the leader in place of Christ, and acting on which side of the frontier? ● Examples are found in confession and absolution. ● We are both the People of God and the Body of Christ. ● Prayer is addressed to God is also addressed to us. ● Prayer is addressed to God, but even though it is not really for our consumption, we must also listen to the prayer, and then we assent with Amen. ● And whether the leader of liturgical worship is speaking on our behalf to God, or on God’s behalf to us, we must be able to both hear and respond. There is a near-universal shape to liturgical worship. Each needs its space, and without respecting that space, people may not engage and participate it in an appropriate way. If this happens, then we fail in our liturgical task. This is what happened to two people I know visiting a church in another Diocese. Of course it would never happen in Lichfield Diocese, would it?????? Well me and Ange decided to use a voucher we’d been given, and go away for her birthday. After booking into the hotel we went to have a mooch round the nearby village. There we found St Mary’s, a beautiful old church. We went to have a look inside and Angie picked up one of their notice sheets and saw that there was a prayer service that evening (Sunday) at 6 p.m. so we thought it would be nice to go along - when we saw that the choir attended on the first Sunday of the month (which it was) that sealed the deal. We turned up just before 6pm and were met by a gentleman (presume he was a Warden) we told him we had come along for the service and he gave us prayer books – quite thick ones which we’d never seen before. There were rows and rows of fully enclosed pews, but the Warden told us the service was held at the front where chairs had been set out. At the front we found three rows of chairs - so being good Anglicans we sat on the back row, with the warden sitting in the front. We were joined by a lady who opted for the middle row. Smack on 6 pm the vicar arrived through a side door which led him straight on to where he sat to the right of the altar. If you include the Warden, me and Ange made up 50% of the congregation. After welcoming everyone he launched into the service which consisted of ‘Question and answer’ type prayers read directly from the book. The problem was he didn’t give us a clue what page we were starting on. The other half of the congregation seemed to know but we were lost. Eventually we stumbled on the right page and managed to join in with the last section. Then the vicar announced that we were going to read a psalm – and in this church it was customary that he read the odd verses and the congregation responded with the even. No, nothing in the book was in order, and again no clue was given as to where to find said psalm. About half way through Angie found it and again we joined in. 1. We wanted to be involved as we were joining in when we could. 2. We didn’t know our way round the book/their service and needed some guidance. Then he announced that we were going to say together the Magnificat – without any further clues he plunged into it. I have to admit by now I was feeling rather angry at the situation and considered asking him in the middle of the service to help us – but decided that instead, at the end I would give him some gentle, light hearted, feedback. No, this man was far too clever and slick for me. At the end of the service we all said together The Peace (but not shared it). Then came a brilliantly executed manoeuvre which left us two amateurs gasping in admiration and amazement. The vicar looked across to me and Angie and said ‘Thank You.’ The lady from the middle row scuttled off and out. The vicar strode across to the Warden, and the two walked off talking, straight out through a side door into another part of the church leaving me and Angie sitting together feeling like we'd just intruded on a private meeting. We literally walked out in silence and were leaving the church grounds before either of us could speak – but then we made up for it. Incidentally, the choir never did turn up. The use of church buildings in relation to the mission of God expressed through the Church (Discussion based on readings from Richard Giles, Re-pitching the tent, Norwich: Canterbury Press, 3rd ed, 2004). 4.2, The nature and theology of sacraments. 5.2, Baptism and Eucharist (2) liturgical renewal among Catholics and Protestants in the 20th century. (Revd Canon Professor) Patrick Comerford is Lecturer in Anglicanism and Liturgy, the Church of Ireland Theological Institute. This essay was prepared on 23 September 2016 for Years III-IV part-time students on the MTh module, TH 8824: Liturgy, Worship and Spirituality, in preparation for a telephone conference on 29 September 2016.